REGISTRATION IS STILL OPEN, SIGN UP SOON. 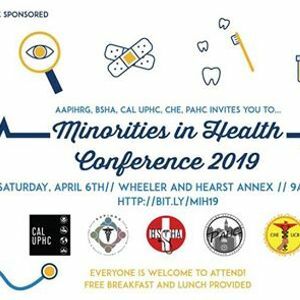 Please join us in this empowering event for FREE on Saturday, April 6, 2019 from 9am-4pm in Hearst Field Annex auditorium and Wheeler Hall at the UC Berkeley campus. Free breakfast and lunch will be provided. 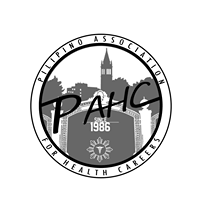 In order to address the under representation of minority health care providers and the lacking health services common in communities of color, the Asian American Pacific Islander Health Research Group (AAPIHRG), the Black Students in Health Association (BSHA), the Chicanxs/Latinxs in Health Education (CHE), the Pilipino Association for Health Careers (PAHC) and Cal Undergraduate Public Health Coalition (UPHC) work together annually to host the Minorities in Health (MIH) Conference. 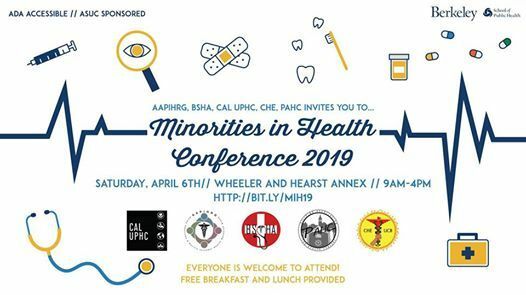 The goal of the conference is to decrease these health disparities by encouraging and inspiring high school, community college, and undergraduate students to strive toward higher education and ultimately careers in health. Here, students will have the opportunity to network and interact with a variety of health professionals and graduate students, attend beneficial workshops, participate in public health discussions, and better equip themselves for their journeys in these competitive career tracks. - MIH 2019 Planning Committee Find our Facebook event page here: Please contact cGFoYyAhIGV4dGVybmFsIHwgZ21haWwgISBjb20= and/or Y2FsY2hlbmV0d29ya2luZyB8IGdtYWlsICEgY29t if you have any questions. Thanks!